If your future includes a move to Moorpark, check out Meathead Movers! Our professionally trained student-athlete movers, moving concierge, and princess packers are prepared to get you safely moved into your new home. When it comes to a simple life in southern California, Moorpark is an ideal spot. The city is located in Ventura County and home to just over 35,000 residents. This size makes it the perfect place for a more connected community with all the amenities of larger cities. For those looking to make Moorpark home, it is helpful to learn more about the city and its history before making a decision. Then, to make the transition as easy as possible, it is critical to enlist the best movers. Early Moorpark thrived thanks to access from the Southern Pacific Railroad, and continues to thrive to this day. Today, the city is renowned for its apricots and celebrates that fact with an Apricot Festival each year. In addition to its beautiful apricot farms, the city also has numerous parks and walking trails, making it a pleasant place to spend time. Moorpark College retains prominence for offering a distinctive Exotic Animal Training and Management degree and is also where we employ some of our top movers. Unlike other movers who hire untrained workers, we hire clean-cut student-athletes who are then trained at Meathead University. The result is a moving staff that is courteous and capable, ensuring that each move is reliable and efficient. To prove that Meathead Movers goes above and beyond, all Meathead employees save time by jogging while not carrying anything, saving you money. While there are numerous Moorpark movers available to get the job done, none can compare to Meathead Movers. 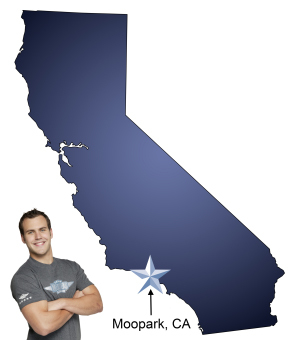 For over 15 years, we have faithfully served as California’s premier moving company. Our moving company specializes in local, long-distance, and commercial moves. We also provide reliable packing, storage, and on-site relocations. From packing to unloading, Meathead Movers can get the job done reliably every time. We work with clients to create a move that is on time and on budget. As an added perk, clients can also use a unique moving concierge service to help manage the transition and connect them with local service providers. Ultimately, the best movers can make all the difference. Contact Meathead Movers today for a free no-obligation moving quote. Moving to Moorpark? Here are some helpful resources. Responsiveness. Care taken with our belongings. Politeness of associates. Everything went smoothly and the guys worked really hard. Good customer service, honest and fair pricing. Tremendous care taken to wrap each piece of furniture— movers hustle. Not to fold the moving blankets on our time. Honestly, they exceeded our expectations. So professional, industrious and polite. Our crew Jose, Kevin and Michael were sensational. The entire truck was filled to the brim. A company appraiser failed to include everything on the inventory and yet our movers still accommodated us and took all that we owned. So generous. They set up our beds, cribs and other large pieces of furniture. Thank you so much Meathead Movers!